At a hip cafeteria in central Srinagar groups of young men and women sit around sipping cappuccinos and cafe lattes. Background music is the Bee Gees and Bryan Adams, the dress code is jeans and T-shirts for men and traditional but elegant salwar kameez for women. There are very few headscarves. It's a scene which would have been unthinkable in Indian-administered Kashmir a few years ago. For almost two decades, the region has been in the grip of a violent insurgency by militants opposed to Indian rule and chants of "azaadi", or freedom, were the first words one heard on arrival. Today, the word "azaadi" is still part of some people's lexicon, but with many young Kashmiris it comes out only after some probing. "In our college, the most discussed issue is personal life. Students talk about their boyfriends and girlfriends, their love trouble," says Ibrahim Wani, a biochemistry student at Sri Pratap College. "The number two topic of discussion is education, career, employment opportunities. Then we share our concern for the environment. The fight for Kashmir's freedom or where the separatist movement is headed is last on the list," he says. A stroll through Srinagar University's walkways, shaded by centuries-old chinar (plane) trees, shows the shift in the priorities of the young in Kashmir. The clamour here is for well-paying jobs, better infrastructure, women's rights and peace. "India is doing very well economically. In the past few years, the country has progressed well. Since we are part of India, we too have a bright future," says commerce student Mudassar Hussain, who is 21. A job fair was held on the campus recently and Hussain was among the 400 students who were offered places by various firms. "The situation is much better in Kashmir now. The killings and blasts which characterised the 1990s and the first few years of this decade have reduced considerably," says Salfia, 22, who is studying to become a lawyer. "In the far-flung rural areas, there are still large numbers of troops and the situation is sometimes grim, but in Srinagar we feel happy now," she says. "We are fed up of the India-Pakistan stories. The youth is not interested in the movement any more." Hussain says the days when young people answered the call to arms are over. "People are more sensible now. Today no one can drag us away and convince us to be a militant. We have to think for ourselves, not follow [separatist leader Syed Ali Shah] Geelani or some other leader." Ibrahim, Hussain and Salfia all belong to that generation which was just taking baby steps when militancy blew up in Kashmir. Violence, strikes and protests have been part of their growing daily life. But today when Kashmir is enjoying relative calm, the young think they can hope for a better future. "We're not interested in going back down that route [of militancy] again. We need to move ahead, we want a normal life. We want peace," says Saima Farhad, an assistant professor at Kashmir University. 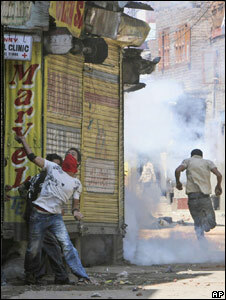 "When we go out of Kashmir, to other parts of India and to other countries, we wonder what we have done with ourselves? We realise we're destroying ourselves," she says. Five years ago, after the state assembly elections, the regional People's Democratic Party (PDP) and the Congress party formed a coalition government. Since then, the situation in the troubled valley has been gradually, but steadily, improving. Troops are still present in large numbers, but less visible. And the withdrawal of despised counter-insurgency personnel has definitely helped ease the situation. Also, with the Taleban (who provided support to the separatist movement) under pressure in Pakistan and Afghanistan and improved relations between India and Pakistan, there has been a dramatic improvement in the security situation. "In the first five months of 2007, there were 27 incidents of violence in which several people were killed. This year, in the same period, there have been only three incidents and none were major," says inspector general of Kashmir police, SM Sahai. Today, the streets of Srinagar are buzzing - shops are open until late at night, tourists who shunned the picturesque valley for many years are now back in their hundreds of thousands, and morale is high. But, says senior separatist leader Syed Ali Shah Geelani the changes are "superficial". "If all is well here, then how come we still have the Disturbed Areas' Act in place? Why does the army still enjoy special powers? The army says there are only 2,000 militants left, then why do they need 800,000 soldiers to fight them?" He admits that a large number of youth have moved away from the separatist movement. "Our youth are being led astray by India, our students are being taken out of Kashmir on education tours and they are being mislead. We are being subjected to cultural aggression." 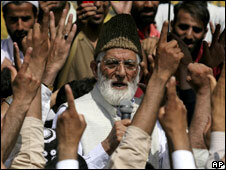 But, Mr Geelani says he is confident that the movement for Kashmir's independence will survive. "People's priorities may change from time to time, but there's no change in our basic stand which is the fight for freedom," he says. Another separatist leader, Shabir Shah, says the present situation can perhaps best be described as a lull before the storm. 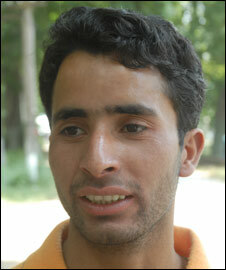 "To say that militancy and the Kashmiri's desire for independence is over is a mistake," he says. "If the government of India makes one mistake, the people of India will have to pay for it." Current events may support his view. In recent days, Kashmir has erupted again with angry protests against plans to build facilities for Hindu pilgrims in the mainly Muslim state. This, say some, shows how fragile the peace is. It needs just a spark to set the place on fire again.